The TVS Apache RR 310S was one of India’s most anticipated motorcycle launch last year. The motorcycle is now on sale and the first batch of buyers have already received their sporty machines. 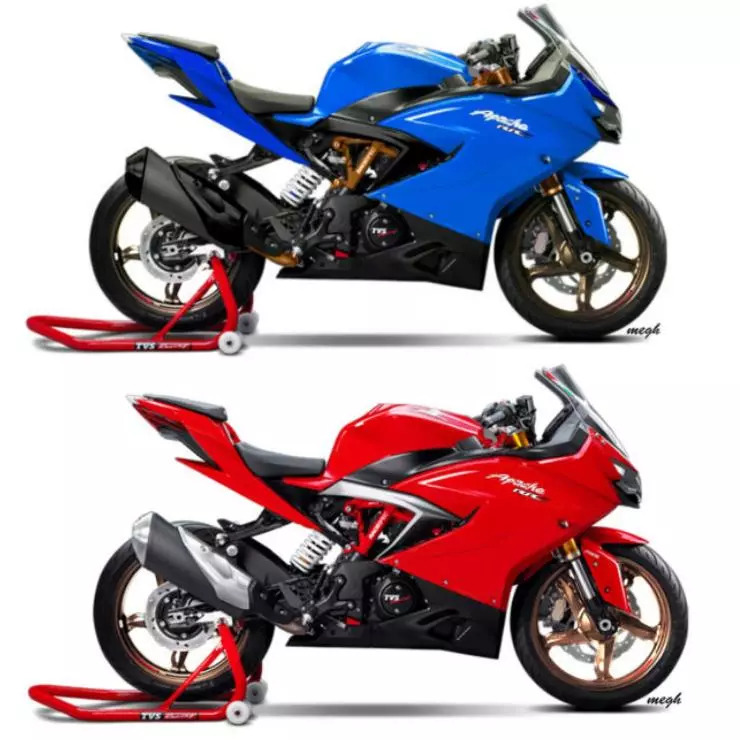 TVS sells the Apache 310 only in two colours: Red and Black. Meghdatt Varachhiya, an automotive design student has come up with a range of new colours for the Apache through renders. Here is the Apache 310 in yellow, camo, white, blue and grey colours. Mr Varachhiya has also rendered a red Apache RR 310 with some really flashy looking golden wheels. 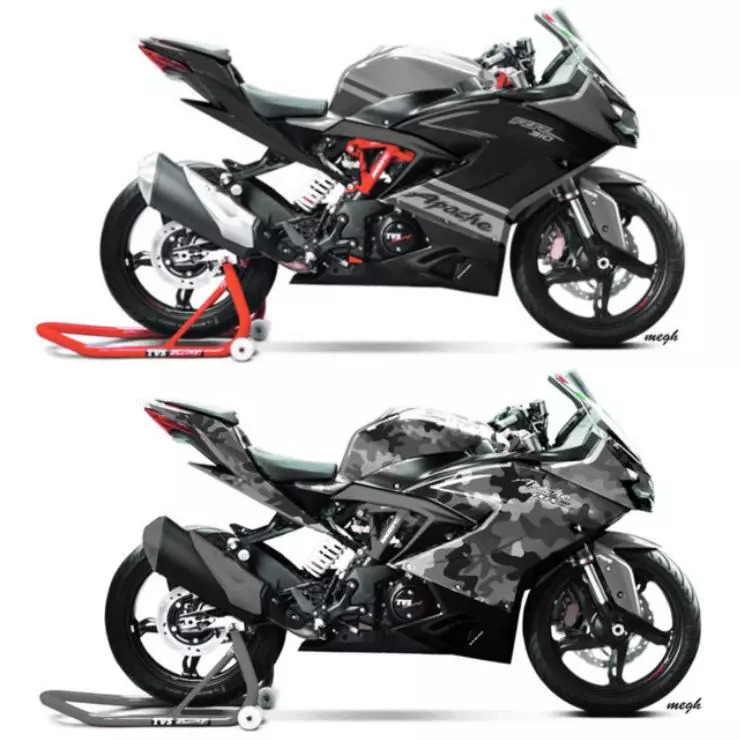 These renders should give existing Apache RR 310 owners some inspiration, and also get prospective buyers to think of customizing their rides in these colour. 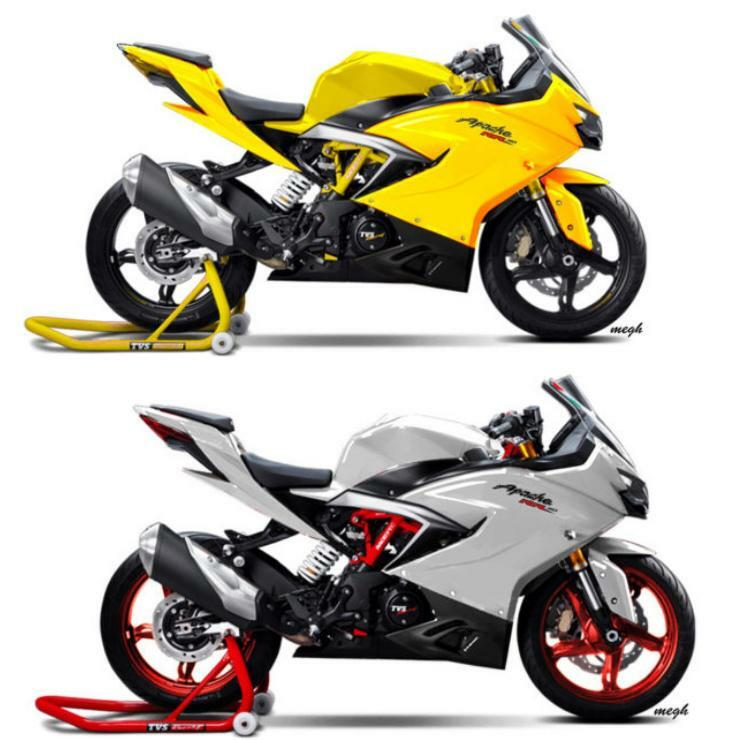 TVS Motors eventually may launch many of these colours on the flagship Apache. The Apache RR 310, priced at Rs. 2.05 lakhs, ex-showroom Delhi, is the priciest motorcycle that TVS Motors has ever produced and sold in India. The bike has BMW genes, in that it features a reverse inclined, 311cc four stroke engine developed by BMW Motorrad. However, the bike is built by TVS Motors, and most parts used on it are sourced locally. BMW mainly offers the technical knowhow while TVS Motors executes it. The 311cc four stroke engine on the Apache RR 310 gets liquid cooling, a four valve head and electronic fuel injection. It makes 34 PS of peak power @ 9700 rpm and 27.3 Nm of peak torque @ 7700 rpm. A 6 speed manual gearbox is standard, and so is an anti-lock braking system. The motorcycle has a top speed in excess of 160 Kph, while the 0-60 Kph run takes just 2.9 seconds. TVS offers upside down front forks and a monoshock rear as standard on the motorcycle, which also gets disc brakes on both its alloy wheels. Tubeless tyres are standard. A fully digital instrument cluster with advanced features including lap timer and top speed recorder are standard.